1 | Camo Lounge Shorts | 2017 was the beginning of my love for camo. I have a camo sweatshirt and sweatpants and always seem to grab them in my closet. It's the new neutral, or maybe it's just showing my true colors as an Iowan. Either way, these shorts would make a great addition to your lounge wear when you get too warm under all of your layers of blankets. So cute, and great to transition into the spring. 2 | Barefoot Dreams Robe | If you buy one thing off this list, this robe has to be it. I'm one of those people that changes into their robe as soon as they walk in the door and I've tried my fair share of robes. This one blows the others out of the water with how soft and warm it is. If you haven't tried anything from barefoot dreams, you're missing out. Softest, most comfortable fabric ever. I could live in mine. 3 | Make + Model Pullover Hoodie | I love lounge wear, especially now that I work from home most of the time. I love that this brand doesn't break the bank, but is so cozy. I took this sweatshirt on my honeymoon and oddly, I think this was my most worn item. So easy to throw on over anything and feel instantly more cozy. 4 | Make + Model Pants | Maybe it's me reminiscing to the days when juicy jumpsuits were popular, but I love having the matching sweatpants. It makes me feel like I'm not a complete slob while lounging around the house. I'm tempted to buy the jogger version of these as well! 5 | Ugg Duffield Throw | There is nothing like a big, soft blanket on a cold winter night. I have an odd obsession with throw blankets and love to have one in every room of the house. I love to have one on my office chair, by our bed for those extra cold winter nights, and thrown over the couch for Netflix binges. This Ugg throw is pricey, but you know it's going to be extra soft and extra warm. 6 | Ugg Slipper | Our new house has freezing, slippery wood floors so slippers are essential, especially in the winter. Luckily there are a lot of good sales right now on slippers! 7 | Nordstrom Butter Slipper Socks | Soo soft that you feel like you just got a pedicure and a great deal! 3 for $19! 8 | Charlotte Tilbury Face Mask | It's the time of year when your face freaks out, because it doesn't know what to do in this extremely cold weather and with the dry heat that you get from your heater. It's been in the negatives here the last few days which means your skin needs extra love. This face mask has fantastic reviews and you hear nothing but good things about the whole Charlotte Tilbury line. I'm dying to try to face moisturizer next! 9 | Herbivore Brightening Mask | This mask was my go-to leading up to my wedding this fall. You can feel and see the results right away. My sister also swears by the Herbivore skincare line. I have been using this at least once a week for the past 6 months and have yet to see the bottom (and you put it on pretty thick!). 10 | Shisiedo Sleeping Mask | This was another essential of mine this fall leading up to my wedding and extremely useful in these harsh winter months. This is actually an overnight sleeping mask. You put it on before bed and leave it on until the next morning. Your face feels so hydrated and refreshed in the morning without feeling like your pores are clogged from a thick moisturizer. I have been using this stuff nightly for the last few month and love the results. This was the first item that I have tried from Shisiedo and have since tried many more! I prefer to spend my new years eve at home, with take out. The last few years we have been in bed before midnight and I couldn't be happier about it. It's nice to wake up on new years day feeling refreshed and ready to take on the new year. This year we are planning to spend NYE with my sister in Iowa. Given she has two kids under two, we are hoping that means it will be a relaxing evening. 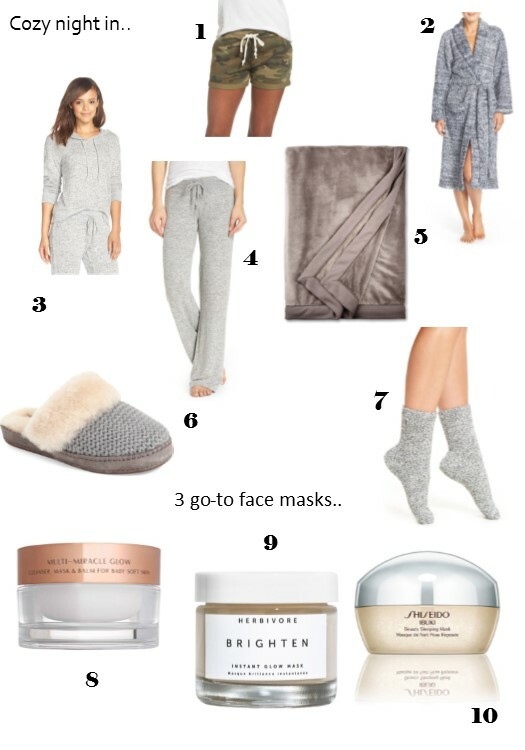 It's nice to curl up in comfy lounge wear and a go-to face mask.